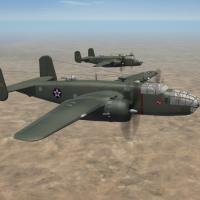 This is a release of Veltro2K's =NEW= B-25B Mitchell Medium Bomber. This represents the first version (nearly) combat ready, as seen in the last half of 1941 through April, 1942. As such, this version really did not see any wartime action, with one major exception. They were mostly used on costal patrols in the Pacific Northwest. RAF versions (Mitchell Mk.I) were used in training, at bases in the Bahamas. All markings are decals. All lighting is historically correct. Damage textures are in DDS format. 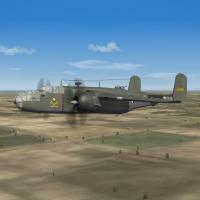 There are nose arts (matched as best as possible from many sources -including the movie), on the Raider's skin, assigned to their historical aircraft. The serials on the 34th are some generic and some historical, as the Raiders pulled crews and aircraft from the squadrons of the 17th BG. Engine sounds, pilot figures, new Hangar & Loading screen are included. Operational service dates are rounded to 'whole months'. But be advised, I've given it a VERY short service life, as the C/D models were already entering service after January 1, 1942. Again, the B model would have been relagated to training and coastal patrol squadron around the USofA. on the Aircraft Selection Drop down menu. This will differentiate it from any other B-25s you may (or may not) have. As always, fairly easy to follow, yet detailed install instructions are included. PLEASE read them!!! PLEASE read the "Notes" section for other important notations.